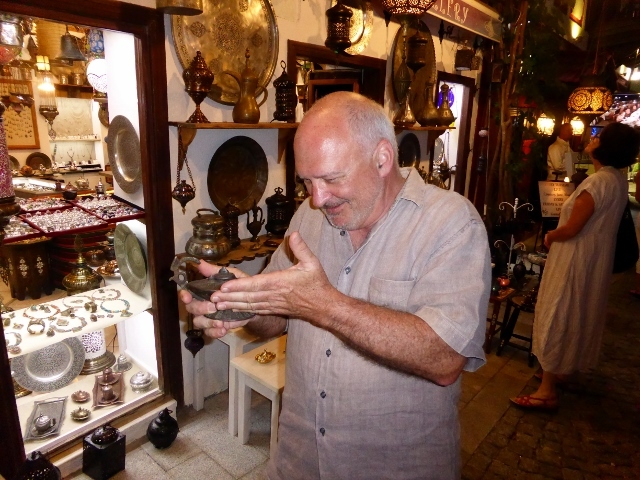 We had a lovely afternoon and evening in Kalkan, we swam, saw a turtle, shopped and enjoyed some wonderful Moet left by Rene and Richard. Very appropriate as we had a slightly late birthday celebration for Louise. Thank you Commodore and Mrs Chapman. We then had a great dinner of Turkish mezes and desserts at the Olive Garden. On the way back to Mercier, we spied Aladdin’s lamp and Frosty was busily making wishes. The long sail from Kalkan to Butterfly Valley, was punctuated by rock formations and fault lines, but once you get to Butterfly Valley and Olu Deniz, para-gliders are numerous. Colourful and almost dangerous, the para-gliders sail close to the shrouds and close to the mountain. They seem to land so close to sunbathers on the beach, a worry if you are on the shore. 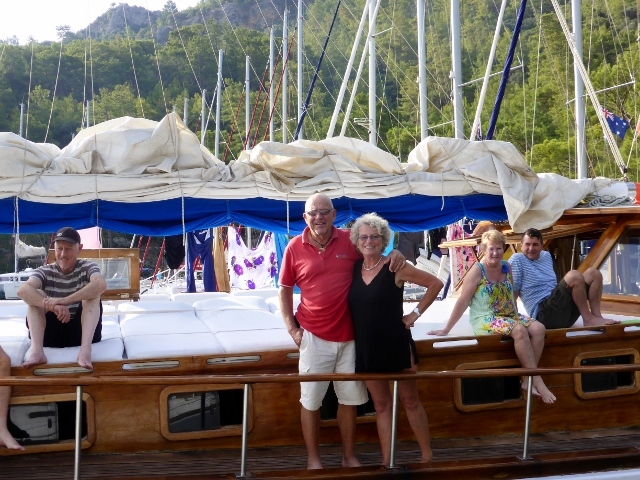 We spent more time at Gemiler Island and swam at Cold Water Bay, where two men from a gulet climbed the cliff and jumped off to Cold Play and the roar of the crowd. Once back on board the gulet, they marched around with a giant Turkish flag to a Turkish marching band. We decided to return to rustic Wall Bay Restaurant. Here we were immediately surrounded by Russians. Five boats sailed in one after another, each with two men and six women. The Russians were female, beautiful, about 22 years old and in very brief bikinis. Men on Mercier, and the boats around us, on the dock and boats across the way turned as one and focused laser like stares onto the Russian derrieres as they tied the boats onto the pontoon. We had wonderful calamari, meze and sea bass sis kebab for dinner. 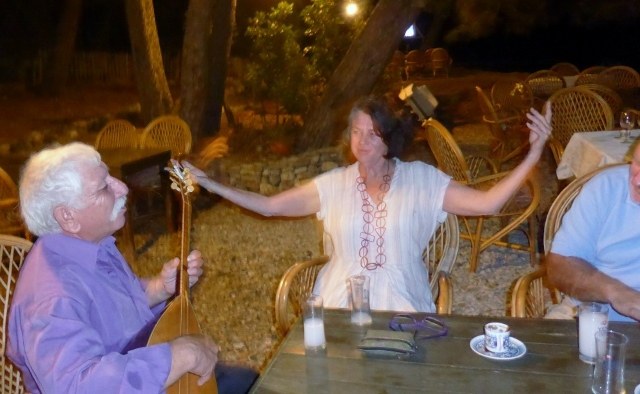 The food at this remote but charming Turkish restaurant is authentic and so is the raki and the entertainment. Raki with turkish coffee at 10 PM, Louise was ready to dance. We had seen this gentleman perform earlier in the evening with an Anatolian flute. For the Mercier crew, he sang a song about raki, while playing on a baglama, which is a similar to a mandolin. We came back to the boat and listened to music, sang and danced to Joni Mitchell, Janis Joplin and Leonard Cohen. 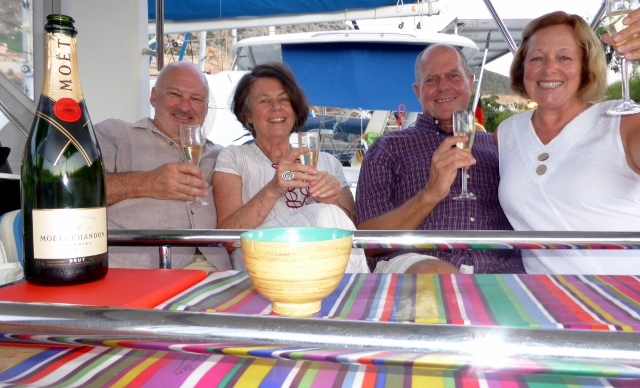 In the morning, we headed over to Deep Bay for a swim and passing Sarsila Bay, we spied a flotilla with a gulet and Mariner Boating flags, we motored over to have coffee with Trevor and Maggie. We had coffee and a tour of their gulet, seeing over the entire boat. It was great to catch up in Turkey and we may be joining them for a gulet trip in a few years. It would be fun to have someone else do the cooking. Just ask Maggie.